The MAVEN team has used the existing national Science On a Sphere program to develop a facilitated program about MAVEN and Mars science. 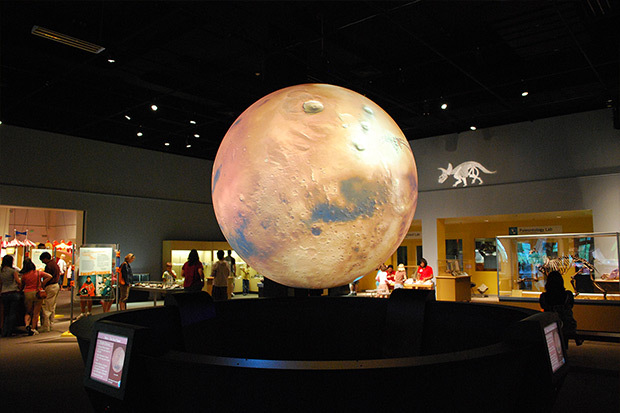 The Science On a Sphere program uses a room-sized, global display system to project planetary data onto a six-foot-diameter suspended sphere. The Sphere is used to explain complex planetary processes in a way that is simultaneously intuitive and captivating. The MAVEN Science On a Sphere project, called Invisible Mars, brings the science of MAVEN to the general public through Science On a Sphere installations in conjunction with the Science On a Sphere Network, the Association for Science-Technology Centers meetings, and via remote technologies. The Invisible Mars project includes professional development opportunities for museum practitioners. The Invisible Mars script and all of the materials you will need to run the Science on a Sphere program at your own installation can be downloaded here. The Invisible Mars module was developed through a collaboration of MAVEN E/PO team members at the University of California, Berkeley and NASA Goddard Space Flight Center/Lunar and Planetary Institute, in consultation with MAVEN Science team members (including MAVEN’s Principal Investigator, Bruce Jakosky, at CU/LASP) and support from SOS professionals at NASA Goddard Space Flight Center and the University of California, Berkeley. The initial script was completed in 2011, and pilot tested in 2012. The MAVEN SOS E/PO team offered a webinar to SOS network members featuring Invisible Mars as well as an overview of the MAVEN mission and its science investigations. Participants were asked to share the Invisible Mars program with audiences at their institutions and then provide feedback to the MAVEN SOS E/PO team. The team modified the Invisible Mars module based on feedback from pilot testers as well as recommendations from the NASA Earth & Space Science Education Product Review. Additional revisions were made based on feedback from participants at an in-person workshop held at Cape Canaveral, Florida in November 2013. The most recent Invisible Mars script and datasets have been updated in April 2017 with the latest MAVEN data and scientific discoveries. This program was developed for DigitalSky 2 by Toshi Komatsu at The University of California Berkeley’s Lawrence Hall of Science. The presenter script is included in the media assets for the show. Please see additional instructions in the “README” file contained within.